The law of gravity dictates that what goes down should not come back up. This is especially true for burning stomach acids that cause uncomfortable heartburn by bouncing back into the esophagus uninvited. Heartburn can indicate an imbalance in the body between acidity and alkalinity, collectively known as pH. Sweet apples are considered alkaline foods that work at a cellular level to restore pH balance and prevent GERD -- Gastroesophageal Reflux Disease -- that stems from an untreated pH imbalance. The sweet and alkalizing nature of red delicious apples may be a gentler approach to stifling burning stomach acids and restoring pH balance. Over-the-counter antacids often interfere with the body’s ability to absorb the nutrients that prevent acid build-up in the stomach, notes Dr. Susan Brown in her book "The Acid-Alkaline Food Guide." 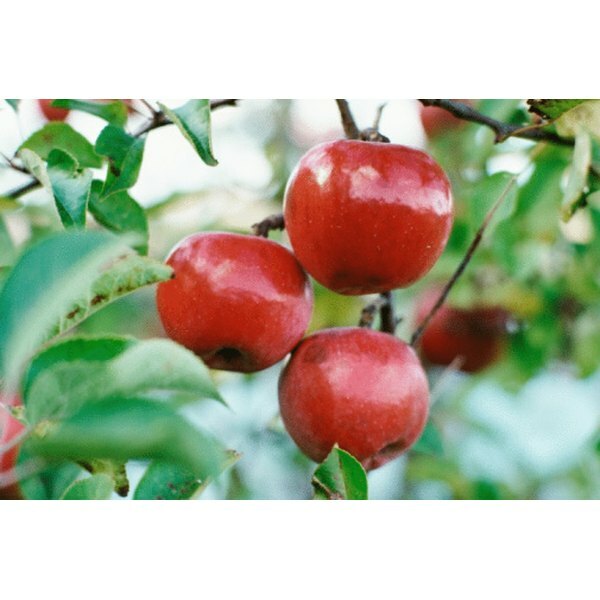 Red delicious apples grow in zones 5 to 8, and are harvested in September and October. Consuming a sweet and tart Granny Smith apple at room temperature right before eating can help to extinguish the burn of acid reflux before it begins. Dr. Brown says that heartburn is often a sign of low hydrochloric stomach acids and enzymes, resulting in partially digested food. Granny Smith apples can help to resolve such problems. Granny Smith apples grow in zones 6 through 8. Newly planted trees usually yield fruit after four to five years. As an alkalizing food, the sweet and spicy Braeburn apple increases the absorption of nutrients and oxygen in body cells and removes stored waste that contributes to pH imbalances. Braeburn apples grow in zones 4 through 10, with harvesting and nationwide distribution in early October. These apples are a more recent cultivar, having been discovered in New Zealand in the 1952. Which Fruits Contain Tartaric Acid?